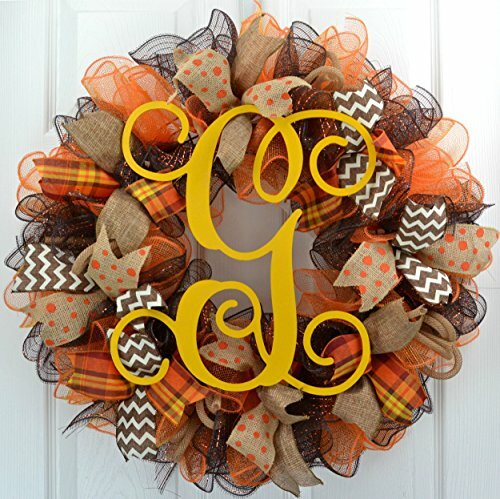 Fall Mesh Wreath | Brown Yellow Burlap Thanksgiving Monogram Letter Initial Mesh Door Wreath : F3 by Pink Door Wreaths at Home Decor Outlet Store. Hurry! Limited time offer. Offer valid only while supplies last. This fall mesh wreath is made with brown, maroon and orange mesh and accented with fall ribbons to showcase the adorable MONOGRAM in the center. This fall mesh wreath is made with brown, maroon and orange mesh and accented with fall ribbons to showcase the adorable MONOGRAM in the center. Measures approximately 24 inches. Indoor and outdoor pieces but my wreaths do appreciate a little shelter from the elements to stay in pristine condition. Thanks for looking! ***This is a listing for a MADE TO ORDER wreath with your choice of colors on the wreath and monogram. Want something more CUSTOM or have questions? Send me a message...I love custom creations! ***Purchase with confidence on a seller with excellent reviews and over 3,000 purchases from my other selling venues. Please message me with any questions before purchasing. Thank you for looking at all of my listings!! If you have any questions about this product by Pink Door Wreaths, contact us by completing and submitting the form below. If you are looking for a specif part number, please include it with your message.